Just around the corner from Ten Trails on Hwy 169, the newly-opened Lumber House Brewery Tasting Room gives our residents a fun place to meet up with neighbors and try some delicious local beer. Given that the Pacific Northwest is known around the world for its craft-brewing scene, it’s hops production, and local breweries, it just seems fitting that Black Diamond–itself a quintessential Pacific Northwest city–have it’s very own tasting room. The Black Diamond location was not in the original plan for the brewery. Owners, Melissa and Jacob Earl originally opened their brewery in Hobart/Maple Valley and recently moved to set up shop in Black Diamond’s Diamond Square right by Sea Bishop Spirits, a local, small-batch gin distillery. The new tasting room features cozy booth spaces, an expansive bar, soaring ceilings with artistic chandeliers and a wood motif that pay homage to the brewery’s name. Wooden tables have been created from wood salvaged from an old tree that fell on Melissa’s childhood property, and the booths are made from stained cypress wood. 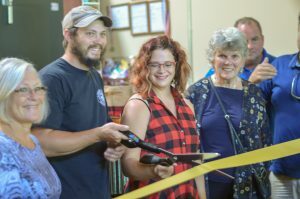 A large crowd of Maple Valley/Black Diamond Chamber of Commerce members, local politicians, City Council member, Janie Edelman, and Mayor Carol Benson, and various friends and family of the Earls gathered at Lumber House Brewery today for their grand opening celebration and ribbon-cutting ceremony. Lumber House Brewery serves a wide variety of beers to please every palate: pale ales, a rye IPA and regular IPA, a pale ale made with spruce tips, Octoberfest lager, oatmeal stout and an amber ale. Offering growlers, “crowlers.” taster trays as well as pints, the beers can be enjoyed both on-site and t0-go. Lumber House Brewery plans on featuring live, local music on a regular basis. Check out their Facebook page and follow them for the latest updates on events at the tasting room.